Another set of live images of Samsung Galaxy S10 and Galaxy S10+ have surfaced online, giving us a clearer look yet we’ve had at the handsets. These come just a few hours after a few live images of Galaxy S10 surfaced online, showing the secure cryptowallet. The new images are in line with them, reiterating the design and display elements of the upcoming smartphones. 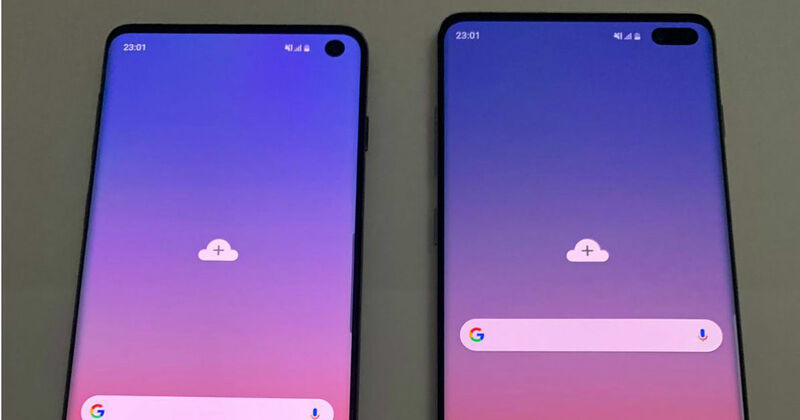 Both the vanilla and Plus models of the Galaxy S10 series are captured in the images, with holes punched in the display for the front camera. The cutout on Galaxy S10+ is obviously larger as it will house two selfie sensors. The bezels are almost negligible, although a relatively thick chin at the bottom is still visible. Going on to the back side, the rear camera setup is exactly the same on both the smartphones with three lenses aligned horizontally alongside a flash unit and the Samsung branding below it. The bottom grill shows both smartphones with a USB Type-C port, 3.5mm jack, speaker grill, and the microphone. According to previous reports Galaxy S10 will pack a 5.8-inch Infinity O display, while the S10 Plus will sport a bigger 6.1-inch display. Both smartphone are expected to be powered by the Exynos 9820 8nm SoC with Tri-cluster CPU, integrated NPU, up to 2Gbps LTE-Advanced Pro modem. Apart from the smartphones, there’s more good news if you’re a fan of the company’s smartwatch. The next Samsung Gear Sport has just been certified by the FCC, suggesting that it could launch alongside the flagship Samsung smartphones. Codenamed Pulse, the smartwatch could come with 4GB of internal storage, Bixby support and all the various features we have come to expect from smartwatches. It will most likely launch in Black, Gold, Silver, and Green colour options.